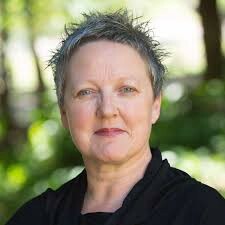 I’m Rosie Odsey and I interviewed Rowena Barrett from QUT in late August 2018. A quick note: My words are in italics. Rowena’s are in regular font. Headings, hyperlinks, and images have been added for effect but the words are ours. Professor Rowena Barrett is Head of the School of Management in QUT’s Business School. Anyone within the school will tell you that she is super approachable, but outside of the university people just think of her as QUT’s ambassador. She’s known for her awesome tweet game and for being at every event in the city but people often forget she’s also a prolific scholar and is actively involved in the goings on of her school and students. When I sat down in Rowena’s office, I was struck by how things had stayed the same. The last time I had visited was mid-2016 when I was getting ready to leave QUT. It still felt the same, even though I had changed so much, QUT had changed so much, and the ecosystem had changed so much. But one thing hasn’t changed: Rowena still greets me with a warm smile as if I had belonged to her school, maybe even as if I still did. QUT has been a supporter of Startup Catalyst for four years. Both organisations have changed significantly in that time. I asked Rowena about how that change has shown up. I think the first time we participated — which was probably early in my role here at QUT — it came in through the QUT Business School. We could see that there was value in supporting students across the university to participate in this event. 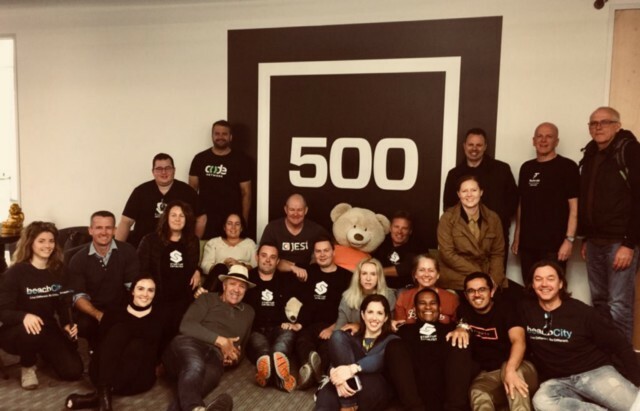 It was just quite extraordinary to give students the opportunity to go to Silicon Valley, see what’s happening in firms, and to do a startup weekend in the middle. It was after that, when we looked at the reports and the media that showcased what the participants got out of it, that we could see how much value there was. We can send students on study tours and international mobility and things like that but this had a whole different intent. It was really quite valuable and you can see that those who went on the missions over the years have really come back with that changed mindset and passion to keep building businesses and ideas beyond that. We can send students on study tours and international mobility and things like that but [Startup Catalyst] had a whole different intent. Alex Ghiculescu (2014) founded Tanda, a workforce success company that continues to go from strength to strength with over 120 staff across the globe. David Buchan-Swanson (2017) joined this number as a software engineer). Tex Andersen (2015) became CTO of Talentvine, a Brisbane tech startup that makes outsourced recruitment affordable, transparent and simple. Matthew Brown (2015) left a role at one of the big 4 consulting firms to join Maxwell Plus, a medical tech startup rethinking the way we detect and diagnose disease (and are doing pretty well). Adam Hibble (2015) co-founded Popgun with Stephen Mawson (formerly of We Are Hunted) under Mawson Ventures where Meg White (2017) works as an AI engineer as she finishes her studies. It’s not all startups! Danielle Vaz (2016) is with Deloitte Digital as a Technical Business Analyst. Kaitlyn Sapier (2016) co-founded OrbMaps and is also with Accenture as a Digital Business Integration Analyst. Jackson Grant (2017) founded Clevver Cup and is now working as CUA’s Innovation Co-ordinator while finishing his studies. Jessie Hughes (2017) continues her work as a VR filmmaker. She was recently awarded the Lord Mayor’s Young and Emerging Artist Fellowship for 2018. As we went through the list of QUT-supported mission alumni, Rowena told me about the coding classes. The youngest one we sent was Mitchell Johnson, the past president of Code Network. He had just turned 18 which was fantastic but he did some great work with Code Network and — I’ve got to say — after I went on the Startup Catalyst trip to London tech week, I got in touch with Mitchell and we ran some pop up coding classes for business students. I can’t code! At all! So Mitchell and I ran a couple of classes, we got Peter Laurie involved in one, and then I talked to our Business Advantage organiser here in the Business school and now we put coding as part of the classes in the Business Advantage program. So it’s not in the formal curriculum but it’s in the co-curricular space. Business Advantage is an awesome co-curricular program available to QUT business students. I know I would have jumped on this class if it were running when I was at university. In the first three years of Startup Catalyst, there was only the Youth Mission (now called the Future Founders mission) sending 20 people at a time to Silicon Valley. In 2017, this exploded out to 6 missions. QUT sent a handful of their staff (Rowena was one of them) on these missions and I asked how this impacted on those staff. It’s about expanding your mind and seeing what’s possible. The trip to London is really interesting because there’s so much going on in London tech week but with the Catalyst group you can get inside places that you perhaps wouldn’t get into if you went to London on your own. 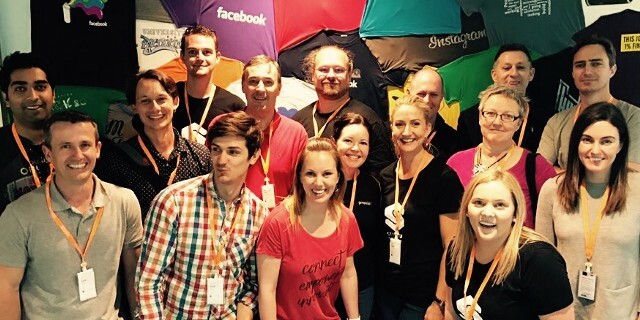 Rowena on the European Mission in 2018 where they visited Facebook and lunched with the 3 Aussies who now work there. That absolute concentration of tech-enabled entrepreneurial businesses is quite incredible and it just makes you realise what is possible when you lift your gaze and look a bit further afield. We also had the opportunity to catch up with some QUT alumni who are running businesses over there. Graham Fellows went on the Startup Community Leaders Mission which featured Boulder, Denver, and San Francisco. We’re talking about a new Foundry* space here at QUT. He took pictures of every community space he went into. We’ll be using a number of these to help us work out — in the space that we’ve got — how are we going to organise it? What walls do we need to move? What’s the staging of people through a Foundry like ours? *Interviewer’s note: QUT Foundry is currently 2 spaces at QUT. When I left QUT in mid-2016, there were no dedicated spaces for students to work on their startups so things have changed quite a bit. QUT students (I think I played a small part) really paved the way to showcasing the demand for entrepreneurial support. From Beer and Pitch nights to Startup Hatch to Disrupting Law, student-led events have shown that students are really hungry for this stuff. I asked Rowena how she sees her role in getting involved with that. We laughed pretty uncontrollably here. Rowena is at every single student entrepreneurship event you could possibly think of. …and then I tweet because that’s about social media savvy as I get. Our role as staff in the university are to support students and support students in a way that helps them to achieve their goals. It’s not about shutting down, switching off, turning around…any of that. How can we help unlock that? As an example, with Disrupting Law, Berni, my PA, did all of the bookings for the rooms because this is one way we can use the access we have to be able to set things up. If you’ve ever had to do room bookings at a university, you’ll know just how much this sort of assistance needs. Yes, there are ways to do it yourself, but having support from someone internal to navigate the systems and processes, it means that you can focus on the event itself. Rowena sees the university as a whole as being a support system for student entrepreneurs. I asked about support roles in general in the wider startup ecosystem. If you want a good, strong, functioning, entrepreneurial ecosystem, you’ve got to have multiple players who have different roles within that ecosystem. You need your entrepreneurs; you need people with ideas who want to do stuff of value. You need corporates because they’ve got money, systems, processes, markets. You would ideally like entrepreneurs and corporates to work together and so it’s important to open up procurement systems in particular so entrepreneurs can be in that pipeline. You need government. We are blessed with a very supportive government and with the Advance Queensland programs which are about priming innovation and entrepreneurship across Queensland. You need government to procure as well so, once again, it’s important to open up those procurement channels. You then need your risk capital and we’re seeing increasing amounts of risk capital available in Queensland. Probably 10 years ago, you would have to go to the bank or to friends and family, whereas now we’ve got high net worth individuals, we’ve got angel capital, we’ve got the business development fundthat will co-invest, at the university we’ve got our founders fund, there’s a social impact fund being established here, there’s Uniquest as well, so there’s a whole range of different capital options that exist. There are still some gaps in terms of capital but that can be worked on. Lastly, you need universities because universities do a range of things. Universities have lots of students. We’ve got 50,000 here at QUT, we’ve got 50,000 at UQ, we’ve got a similar amount at Griffith. 150,000* in this city alone plus more from the other universities. They are the original thinkers; people who are motivated to make a difference in the world. *I checked. In 2015, it was 142,433 across the 3 universities so this number isn’t far off! The other aspect of universities is the research. It’s the sort of research that, by and large, does not happen anywhere else. Ideally, a lot of it can be commercialised out into the ecosystem. Sometimes academics have no desire to commercialise research so we need others to help them to do that. You can look at someone like Vald Performance: it wasn’t the founders’ IP; they purchased that IP from the university to establish an incredibly interesting business that’s doing really well. So you actually really need to have all those players in the ecosystem if it’s going to work. It will not work if it is just entrepreneurs or just government or just universities. Everyone has a role to play. I don’t know if Rowena is completely based this view on Brad Feld’s Boulder Thesis, in particular the concept of leaders and feeders, but it echoes the sentiment. As our ecosystem is matures, it seems that QUT has figured out its role in the ecosystem and is quite clear on that. I asked Rowena if she thinks the ecosystem itself has found clarity in all of these hats and roles that exist. Are we getting closer than we were? Look, over the last 4 or 5 years, things have changed considerably. I think we’re a bit beyond nascent; there’s more happening but that means that there’s probably a lot of overlap between what different parts do. That’s not unusual and there will be at some point a bit of a fall out and a reorganisation as people become a bit more sophisticated in understanding what it is that they need and what’s available to them. I think that’s pretty usual in the way ecosystems work. QUT’s contribution to the ecosystem, through Startup Catalyst and a whole raft of other initiatives, is significant. I asked Rowena what she was excited about within the university. There has been recognition at QUT for the last couple of years that entrepreneurship is an important part of what we do. It’s part of our DNA. As well as this, we know from our survey of alumni that many of them play in creating value through entrepreneurial activities either within firms or through their own firms so we know that is somewhere that alumni wish to go. But we also know that the world of work is changing. We’re not in the job of creating fodder for the corporate machine. We’re in the job of creating thinkers and doers and entrepreneurship is a part of that doing. Now not everyone needs to practice entrepreneurial action by building their own business — they can do it in a range of different ways. For us it’s about ensuring that you’ve got deep discipline knowledge but across the top you’ve got the skills and you can apply that knowledge in a range of different ways; being entrepreneurial is one of those ways. So at QUT we will be reorganising our assets, yet again. We have many entrepreneurial assets. We’ve got a lot of different parts that work with students and we’ll be organising that to put a learning spine through it in the co-curricular space The idea is to make sure that across a year, for example, we have a program that flows: you start knowing nothing, you come out you can pitch and sell and whatever you wanna do. Part of that is because we work with others who do this really well, MIT in particular. Currently, we bring the MIT innovation and entrepreneurship bootcamp to QUT. We’re part of a regional entrepreneurship acceleration program at MIT. I’ve spent a bit of time in and out of the Martin Trust Centre for MIT Entrepreneurship and see what they do and how they’ve organised their programs. We’ll be using a lot of that learning in developing our system and we do that because MIT is one of the most entrepreneurial universities in the world. The amount of support that the university is giving has just blown up. When I was there, you the only accessible pathway to entrepreneurship within the university was taking an entrepreneurship minor through the school of management (Rowena heads this one up). Things have come a long way since then. Now a student entrepreneur can have support all the way through their degree and pretty much all the way through to an established company. Now a student with an interest in entrepreneurship has multiple pathways to trying it out. As a university, we can’t do it on our own. We absolutely want to partner with all people and groups outside the university. We don’t have a hold on students. We don’t expect that students will only do the things that we put on — that’s not how it works at all. It’s only through that partnership with others that we will be successful in ensuring that our offering to students is useful and valuable and Startup Catalyst is one of those key partners. Stuff down at the Precinct? Yep, we’ll be involved. Stuff at the Capital? Yep we’ll be involved. With the other universities? Of course! I have suggested that all the student entrepreneurship groups get together across the universities and run a hack the university weekend. So UQIES, QUT Starters, Code Network, UQCS, GLUE, Enactus, it’s up to you. Over the coming weeks and months, we’ll be posting pieces like this to showcase how incredible business leaders have found their way into the startup community, what their involvement looks like, and what it’s done for them and their organisations. If you love what we do and want to help, the easiest way to support Startup Catalyst is by contributing to the Future Founders mission. If your organisation is interested in sponsoring a future founder (or a few), please take a look at our scholarship program or get in touch. We take groups of youths, startups, investors, corporates, and innovation leaders to international startup hotspots with the goal of transforming the startup and innovation landscape in Australia. If you are interested in heading on a future mission, check out the upcoming program here. The easiest way to support what we do is contributing to the Future Founders mission directly. If your organisation is interested in sponsoring a future founder (or a few), take a look at our scholarship program or get in touch. Like what you’re reading? Tweet us!